In this extremely unique and completely packed photographic adventure, we will chase the Aurora Borealis, experience an incredible overnight at a remote bear lodge accessed only by sea plane, take in the stunning golden light that glows on Alaskan glaciers, visit the visually remarkable fjords, experience fall colors in Denali National Park (Denali NP), search for bears, whales, eagles and so much more! Not sure you'll make it to Alaska more than once in your lifetime? This tour was made for you. We plan to cover all of the parts of Alaska that stand for what it truly is, so you can return home feeling you experienced the beautiful land in its authentic entirety - with stunning, professional-level, once-in-a-lifetime photographs to prove it! This adventure is extremely exclusive in that it is limited to five participants (for this year only)! 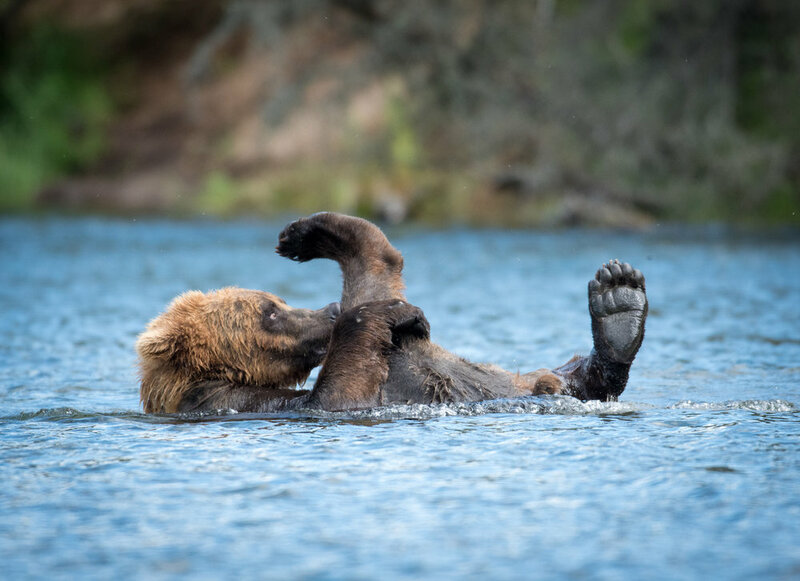 With two photographer guides, including award-winning conservationist and Alaskan photographer, Carl Johnson, and only five participants, you will absolutely receive the one-on-one attention you and your photography efforts deserve! Our local photographer guide knows this last frontier intimately and will be giving us the most authentic Alaskan experience - including a home-made Alaskan dinner at his stunning gallery! Our expedition includes everything that is iconically Alaska: wildlife, like bears, eagles, whales, puffins, seals; gorgeous landscapes with silky waterfalls, dramatic mountains, fall colors in Denali NP, sweeping glaciers - not to mention our nightly hunt to capture the awe-inspiring Aurora Borealis in our lenses! LIGHT! We know how golden hours have the ability to dramatically light up and alter our perspectives on a scene, so we chase many sights when the light is right! Why have a regular photograph when you can have one that appears to glow? Our expedition is a mixture of photography opportunities and experiences. We hunt these beautiful landscapes, and we also aim to experience Alaska by offering engaging activities like trekking on glaciers and enjoying authentic fine-dining amongst the setting of remote bear lodges. We strategically organized this expedition so that it includes a mixture of beautiful photography opportunities and engaging moments. Because we believe the most stunning images are the ones that have special moments attached to them and messages dripping through them. We think the most empty photography tours are the ones where you get plopped on a bus and shuffled from one spot to the next, given only "15 minutes in this spot!" to take your photos. How can you connect to your landscape, garner a feeling that you want to capture through your lens and translate into your photographs like that!? So, to solve this unfortunate issue we see all around us with other photography tours, our Alaskan guide, Carl, and I have challenged ourselves to strategically pick a mixture of authentic and downright breath-taking Alaska landscapes, and experiences that snap our photographer participants out of their normal routines in order to open their eyes and lenses to seeing and capturing in a new way. 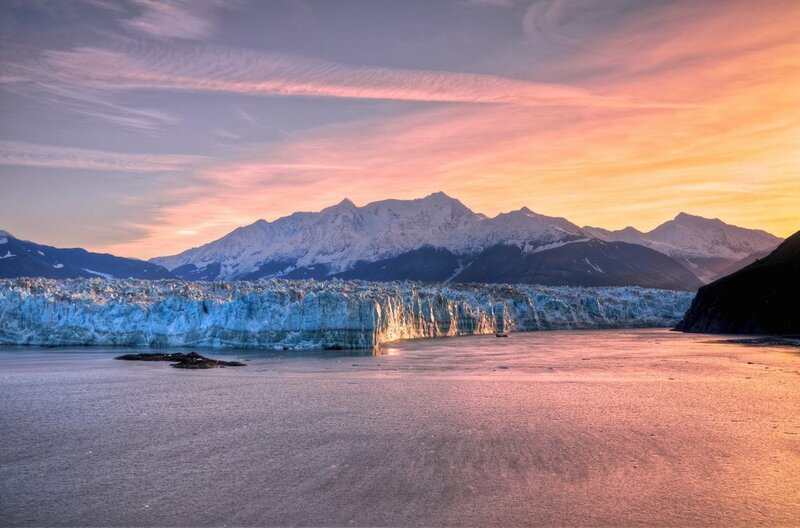 We do this through making a concerted effort to take you all the way from the visuals of Anchorage to a complete season-change of fall in Denali, and activate new sensations within you by truly engaging with our photography subject, Alaska, such as trekking on glaciers and dining incredibly at a remote lodge in the setting of bears. Don't miss this once-in-a-lifetime experience! Arrive in Anchorage, located on the edge of Cook Inlet and the Chugach Mountains. After settling in to our Anchorage hotel accommodations, we will join our local Alaskan guide at his Anchorage hillside home and gallery for a welcome dinner and preview of the days ahead. We proceed north to Denali National Park and spend the evening exploring the entrance to the park to the Savage River. Along the way, we will photograph autumn colors and the rugged mountain landscapes of the Alaska Range, and look for moose, caribou and other wildlife that frequent this part of the park in the autumn. At night, we will look for the aurora borealis. We will take a morning drive through the opening stretch of Denali National Park before heading south to Talkeetna. We will stop along the way to photograph the Alaska Range in Broad Pass. After checking in to our lodging in Talkeetna, we will explore the iconic small town, said to be a model for the fictional town of Cicely in “Northern Exposure.” We will photograph evening light at the convergence of the Chulitna, Susitna and Talkeetna Rivers. After dinner, we will head back out in hopes of capturing the Aurora Borealis. After breakfast, we will continue south to the Matanuska Valley and explore this vast landscape that divides the Chugach and Talkeetna Mountains. 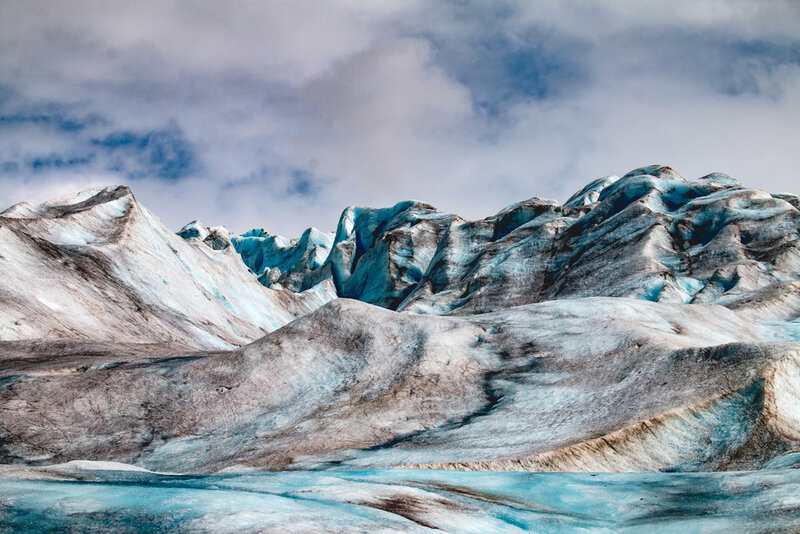 As part of the day, we will take a 3-hour guided hike out onto the Matanuska Glacier, to explore the ice formations and photograph them up close. We will continue south and explore the coastal landscape and waterfalls of the Turnagain Arm. We will overnight in the isolated coastal town of Whittier. We will spend most of the day out on a boat in Prince William Sound, exploring this network of islands, coves, bays and glaciers to capture this iconic landscape and look for marine mammals and sea birds along the way. We will explore the small boat harbor in Whittier in evening light and at sunset. We depart Whittier early to head back to Anchorage and catch our small plane flight out to an exclusive lodge in Lake Clark National Park & Preserve. There, we will have the assistance of a lodge guide to take us out to view and photograph the Alaskan coastal brown bear. In the evening, we will retire to the lodge for a gourmet dinner, wine and photo review. We take a small plane flight in the morning back to Anchorage and the completion of our voyage! This expedition already happened! But don’t worry, we’re doing it again this year! To book your spot on this year’s Alaska photography expedition, click here! Carl Johnson... One of the best aurora photographers anywhere. Exclusivity: Limited to five participants only! One-on-one attention: Two photographer guides for five participants promises the help you deserve! Expert local knowledge: Award-winning conservationist and Alaskan photographer, Carl Johnson, offers us an intimate experience of the land he calls home! Everything iconically Alaska: We make sure to bring it all to you in one expedition: wildlife, gorgeous landscapes, our nightly hunt for the Aurora Borealis, and more! Light: We chase many sights when the light is golden and right! Experience: Our expedition is a mixture of photography opportunities and engaging experiences. Plan to arrive at the Anchorage (ANC) airport around 3 p.m. on September 1. Our hotel, The Lakefront Anchorage, will provide free shuttle service from the airport to the hotel. The shuttle runs every 30 minutes, 24 hours a day. The shuttle pick up location is where the other buses and taxis are. The shuttle is a silver Mercedes Sprinter with The Lakefront Anchorage logo on the side. Plan to arrive to the hotel by 5 p.m. to check in and get settled. At 6 p.m., we will all meet in suite 1004 (first floor, hallway right of the stairs) of The Lakefront Anchorage and Carl will take us to his gallery for a private orientation, dinner, and perhaps a chance at the Aurora! Carl will take us back to the airport in Anchorage on September 7. We should arrive to the airport around 2 p.m., so plan departure flights accordingly. Any participants departing after this time on September 7th will need to arrange for their own transportation to the airport. 100% of Marisa's students rate her teaching as "EXCEPTIONAL." "very well" after her lesson. This itinerary is subject to change. The opportunity for photography and astrophotography is based on proper weather conditions. If the weather conditions are in any way hazardous or unfavorable, the photography guides reserve the right to cancel in-the-field instruction for affected days.